New Premium Wiring Harness for Stratocaster CTS, Orange Drop 5 Way CRL Treble Bleed with Greasebucket Tone circuit on Bridge pickup. We are now using the highest quality Potentiometers that the CTS Corporation manufacture. WD® Music Products developed these high-quality split-shaft potentiometers with CTS® to offer you exceptional performance in electronics for your instrument. These are NOT the same CTS pots that other companies stock and sell. These are developed using 9% +/- tolerances and a value at 10% over the standard 250K rating (275K). This ensures you not only optimum performance but guarantees your potentiometers will always be at least the value stated unlike many others using 20% tolerances where you can be over spec but in most cases way under the specifications you need to ensure good tone from your pickups. They added brass components and a high quality wiper versus what comes standard on most run of the mill pots to ensure long life, quality and consistent performance. They even chamfered the tops of the posts so as to make installing the knobs easier. This is a professionally built pre-wired Stratocaster wiring harness upgrade for American or Mexican Fender Stratocasters. Genuine Fender Vintage Stratocaster Aluminum Shield for mounting under the Pickguard. 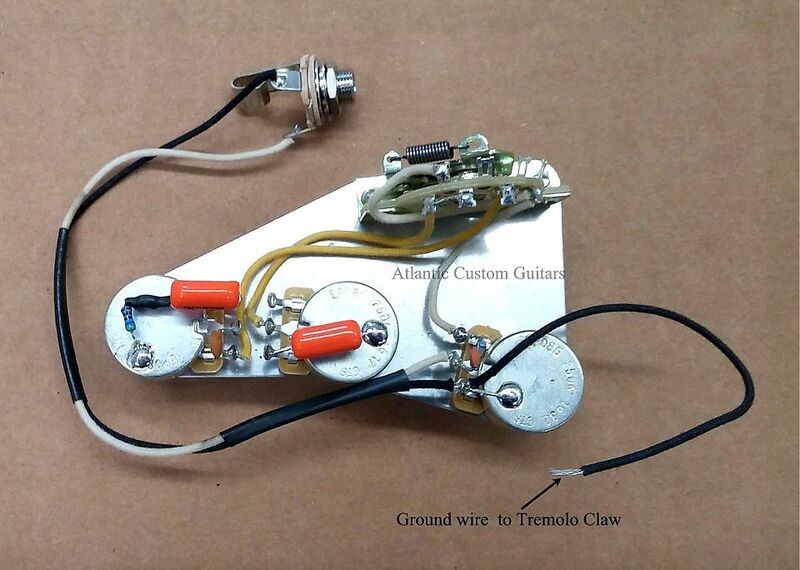 I also include 2 pre-soldered ground wires from the volume pot (pictures only show one, I haven't had time to update them) one to hook up to your tremolo claw and the other is for hooking up your 3 pickup ground wires. 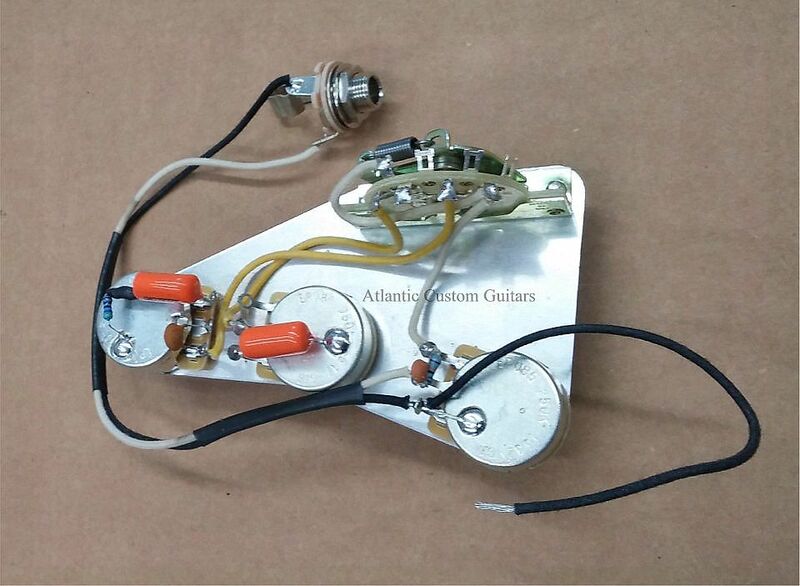 Atlantic Custom Guitars hand wired Strat harness featuring all top shelf components. 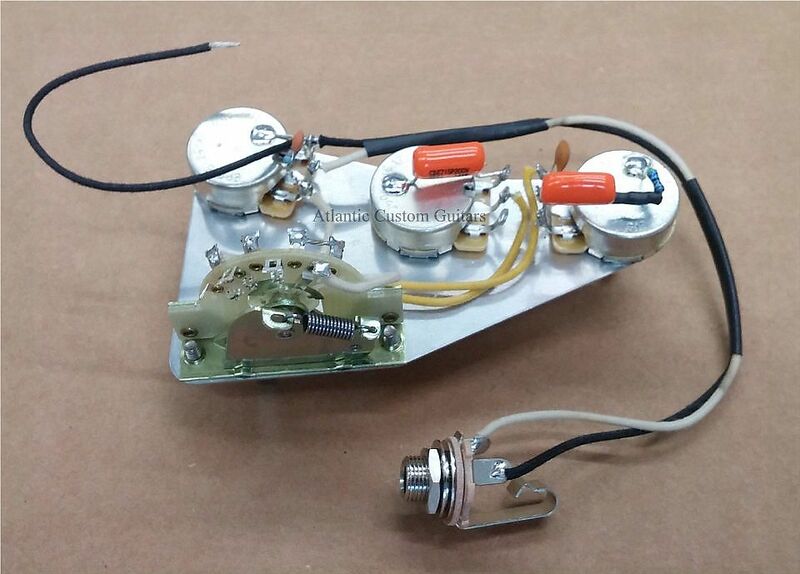 It's pre-wired and ready to drop into your guitar to upgrade your tone. The front tone is wired for the neck and middle pickup. 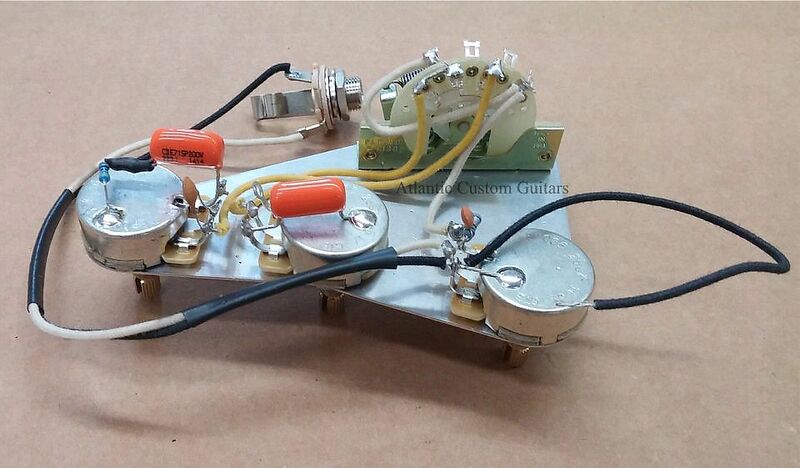 The bottom tone has the Grease Bucket circuit for the bridge pickup. All international shipping quotes, include insurance.